Tenleytown Gives Back this Holiday Season | Tenleytown, D.C.
‘Tis the season for giving in Tenleytown as the winter holidays remind us all of the importance of community, family, and philanthropy. Several local organizations are sponsoring special events and donation drives to help those in need right here in the District, as well as those who are struggling around the world. We’ve compiled a list of local opportunities that may be of interest to our readers. This list is by no means exhaustive, so please email us with other opportunities in the neighborhood and we’d be happy to help spread the word. ∗ During Tenley WinterFest, going on now, you can support Friendship Place, an outstanding local organization working to end homelessness, with just the touch of your finger. 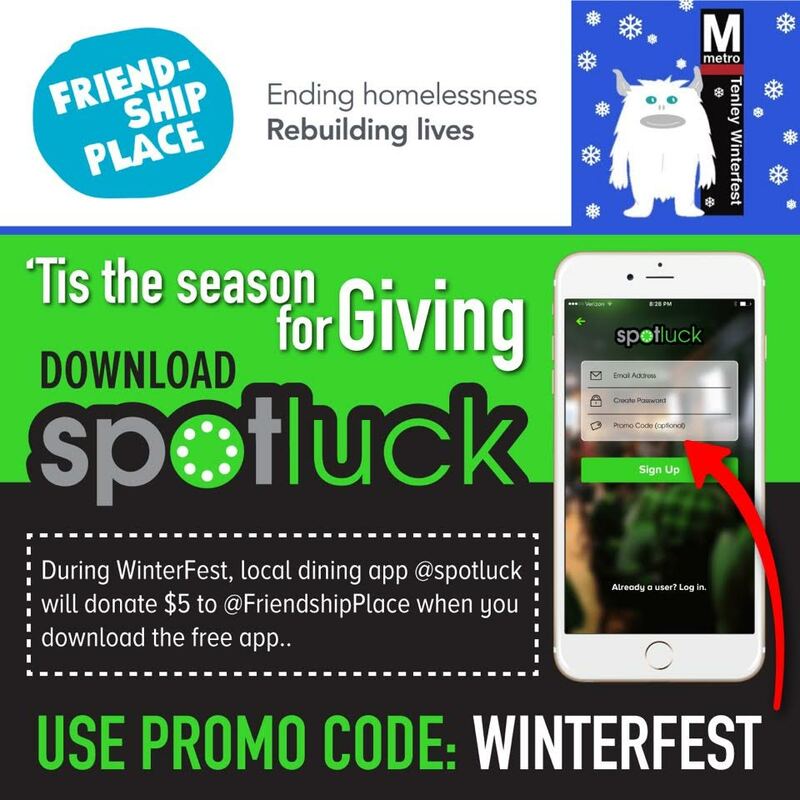 Now through December 5, download on your smart phone the free dining app Spotluck, and Spotluck will donate $5 to Friendship Place. Just use promo code winterfest. It’s that simple. As an added bonus, when you use the app you can get 10% or more off your dining bill at 200 participating restaurants in the DC Metro area – including 12 in the Tenleytown/Friendship Heights neighborhoods. Spotluck is available in the App Store and on Google Play. ∗ Residents can also support the work of Friendship Place by participating in the 5th Annual Winter Warmth giveaway. Friendship Place will be collecting winter essentials at the St. Luke’s Mission Center, 3655 Calvert Street, NW, to give to those experiencing or at risk of experiencing homelessness. Donations of new and gently used winter essentials – coats, scarves, hats, gloves, and boots – as well as new, unworn long-underwear and warm socks can be delivered to St. Luke’s Mission Center on Thursday, December 3 from 10:00 a.m. until 6:00 p.m. and Friday, December 4 from 10:00 a.m. until 7:30 p.m. Residents can also sign-up online to volunteer to help sort clothing donations, contribute food for the giveaway event on December 5, help serve a hot meal, and/or distribute clothing. ∗ Also during WinterFest, St. Ann’s Church is collecting new toys, new articles of children’s clothing, and gift cards to benefit families in need at the Spanish Catholic Center in Mt. Pleasant. The center provides medical care, job training, case management, and a food pantry for immigrant families from around the world. Donations can be delivered to the church undercroft on Saturday, December 5 at 6:00 p.m. And don’t forget to stay for a free showing of The Polar Express, which is open to the community. Show time is 6:30 p.m.
∗ The Citizens Advisory Council for the Metropolitan Police Department’s Second District is also hosting a toy drive through December 11. Each year the Second District police, who serve throughout northwest Washington, host a special holiday party for disadvantaged children in D.C. This year they are giving back to 60 kids, ages 5 to 14 years, who all live in Ward 8 and come from families in need. To help make the holiday brighter for these kids, the Citizens Advisory Council is asking residents to consider donating a new, unwrapped toy. Donations can be delivered to the Second District station, located just behind the new Giant on Wisconsin Avenue, and placed in the donation box in the lobby – just look for the snowmen. Your gift will be delivered to a deserving child on December 12. ∗ lil omm yoga wants to lift some weight off the shoulders of refugees in Europe – quite literally. The community yoga studio is collecting new and gently used infant and toddler carriers, e.g. Baby Bjorn, Ergobaby, and wraps, for families who are fleeing unrest in the Middle East and Africa. Refugee families often have to traverse hundreds of miles by foot, carrying their children in the arms. Through Carry the Future, which delivers infant carriers to refugees in Greece – one of the main entry points to Europe, lil omm will help these families keep their small children more safe and secure on their journey. Donations can be delivered to lil omm, 4708 Wisconsin Avenue, through December 13. ∗ It might be raining right now, but snowy weather is just around the corner. The D.C. Resident Snow Team is still seeking volunteers to help senior citizens and residents with disabilities clear ice and snow from their sidewalks following winter storms. Volunteers can register online. The commitment is flexible – help on your own schedule during a snow day and assist however many or few patrons you are able. You can choose to volunteer locally or in neighborhoods across the city.